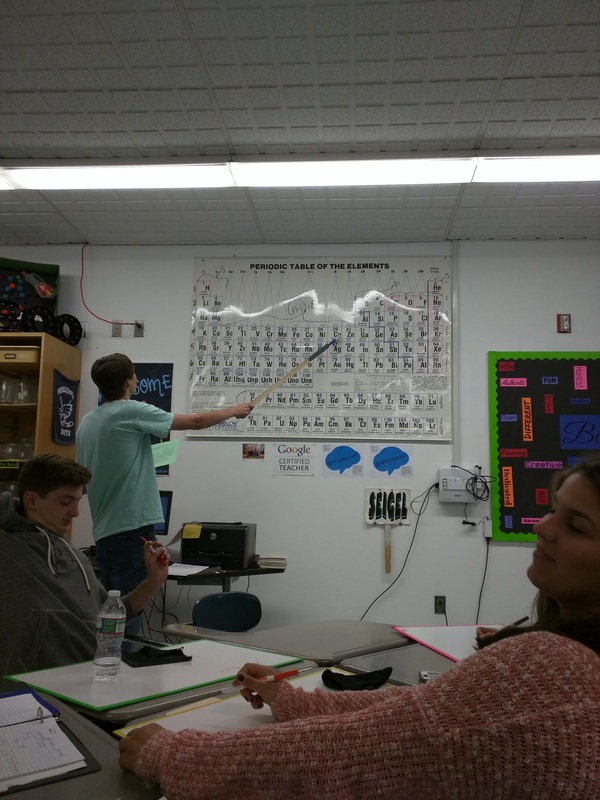 When I first started teaching, I was fortunate to walk into a fully stocked Chemistry classroom. It was a Chemistry teacher’s dream room. Problem was I didn’t know how to use the stuff. Well, I mean I had a degree in Chemistry so I knew how to physically use everything; I didn’t know why I should be using it. So, I went to the catalog and ordered some kits. The kits have it all: lab manuals (teacher and student copies), everything pre-measured, all the right equipment, and expected results. Now I just had to photocopy everything (yes, I used to use paper. A LOT!!) and the lab would run itself. Now that I had experience to guide me, I knew everything I needed for the lab. I found cheaper ways to buy the chemicals, I reused equipment from the kit, and I rewrote the lab sheet to make it work better for my classroom. The best advice I can give anyone just starting out in teaching or teaching a class they have never bought before: buy the kit first. Let someone else do all the prep work so you can make the activity as meaningful as possible. Then go about making it your own. This entry was posted in #chemisawesome, #ideas, chemistry, Uncategorized and tagged #ideas, chemistry, experience, first year teaching on August 26, 2017 by DaretoChem. Recently I accepted a position to be the Educational Technology Specialist for my building. Basically I am a tech trainer for both students and teachers. I could be fixing computers, installing software, training teachers on new programs in small settings, teaching tech lessons, running the makerspace, doing mobile maker projects, assisting in Shark-tank style projects, running building PD, teaching administrators how to use their new laptops, problem-solving PowerSchool issues,….and those are just the things I know I will be doing. And, I will be teaching 1 class which is not Chemistry. It is called Innovation and Design and there will be more to discuss on that topic soon. But, you read that right, no Chemistry. I have been teaching Chemistry for 17 years. Even when I was a District Director of Instruction I still taught 2 classes of Chemistry. I have been doing Chemistry either as a student or a teacher since 1993. And now…nothing. Research Methods in Applied Science years for the first time, I had no idea what that class would entail, but I had Chemistry as my safety net. When I was a Director, I had no clue what I was doing, but I had Chemistry as my security blanket. Chemistry will always remain at my core (just like fencing). Every day I tell my students that they must be happy in what they are doing and to pursue their passions. Now it is time for me to do the same. This entry was posted in chemistry, Uncategorized and tagged chemistry, I&D, passions, technology on July 5, 2017 by DaretoChem. What does a typical #flipclass lesson look like? This is one of the most common questions I get asked when I talk to educators about the Flipped Classroom. The truth is there isn’t a “typical” lesson in my class. Every class has a general plan, but since each student is working toward an individual goal, each day is different. But, my classes on Monday went really well so I wanted to share what was happening along with some pictures to illustrate. On Monday, we were finishing the work we were doing on Electron Configurations and starting the unit on Naming and Forming Compounds. I had a DO NOW on the screen asking students to write the electron configurations for Zn, Ba, and Rn. Since the lesson on EC was 4 days prior (one of the negatives of block schedule) most of the class was confused. I asked a student who felt he knew EC’s well to come up to explain it to the class and answer their questions. Now, the assignment posted in Google Classroom kicked off the next unit we were studying. There were 2 instructional videos to watch (both less than 5 min), a Self-Check Quiz in a Google Form (which was auto-graded by Flubaroo with the score and answer key emailed in return immediately), and practice problems to complete (yes, you can read that as a worksheet). The practice problems are necessary because we are at a point where drill and kill is a necessary technique to get students to truly understand what is happening. Now, this is why I can’t give you a traditional lesson. At this point in the block, I have 3 levels of students: those still working on the Electron Configuration HW because they needed that extra practice, those taking notes, and those working on the practice problems. That is 25 students spanning 2 different units. But, if a class didn’t have the faster learners, they might all have stayed together on the same topic for longer. I can’t predict that until we are actually in the middle of the lesson somewhere. The Flipped Classroom isn’t a magic bullet and I don’t think that I am a good teacher just because I use it. What I do know is my students get a greater level of support from their teachers because of it. My faster learners no longer feel like they are being held back, the students who need more support get more attention from me and get more of their questions answered, and I get to talk to every student every day. The beauty of the Flipped Classroom is that no 2 classes look exactly the same. My Flipped Classroom will and SHOULD look different from yours. You have different kids, a different school, and you are a different teacher. No matter what you do or how you do it, just remember to make the time that you spend with your students meaningful! [Author’s Note]: this post was originally written at the beginning of October, but was never posted. 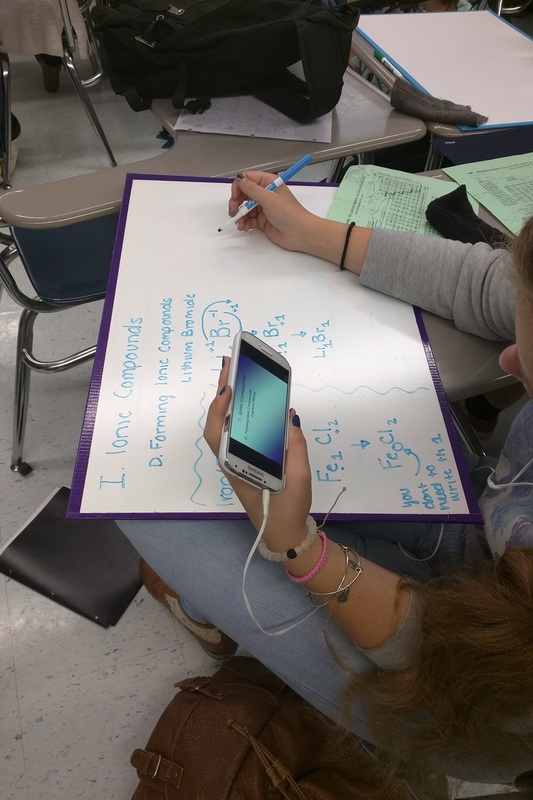 This entry was posted in #flipclass, chemistry, flipped classroom and tagged #flipclass, #roomofawesome, chemistry, student-centered on November 12, 2015 by DaretoChem. I love Chemistry for a lot of reasons, but mostly because it helps explain the world around me. In case you were living under a rock, during the AFC Championship game, it was found that the New England Patriots deflated their footballs by about 2 psi. The ensuing scandal was named Deflategate by the media. At a press conference, about a week later, the Patriots organization claimed that the rapid change in air temperature from their equipment room (approximately 72F) to the football field (approximately 47F) caused the pressure to drop. A colleague (Mr. B) came to me and said that he saw a piece on a news channel that had Bill Nye the Science Guy facing off against a Harvard professor debating whether Chemistry was at fault for the pressure drop. It was very West Coast vs. East Coast like the Super Bowl was going to be. And, let’s just say, that people need to stop doubting the genius that is Bill Nye. Anyway, any good Chemistry teacher knows that the relationship between Pressure and Temperature of a gas is directly proportional so, technically, if the temperature went down the pressure would go down as well. But, any good Chemistry teacher will also tell you that what applies on one side of the football will apply on the other; meaning if the Patriots had this problem so would have the Colts. Ok, I digress again. 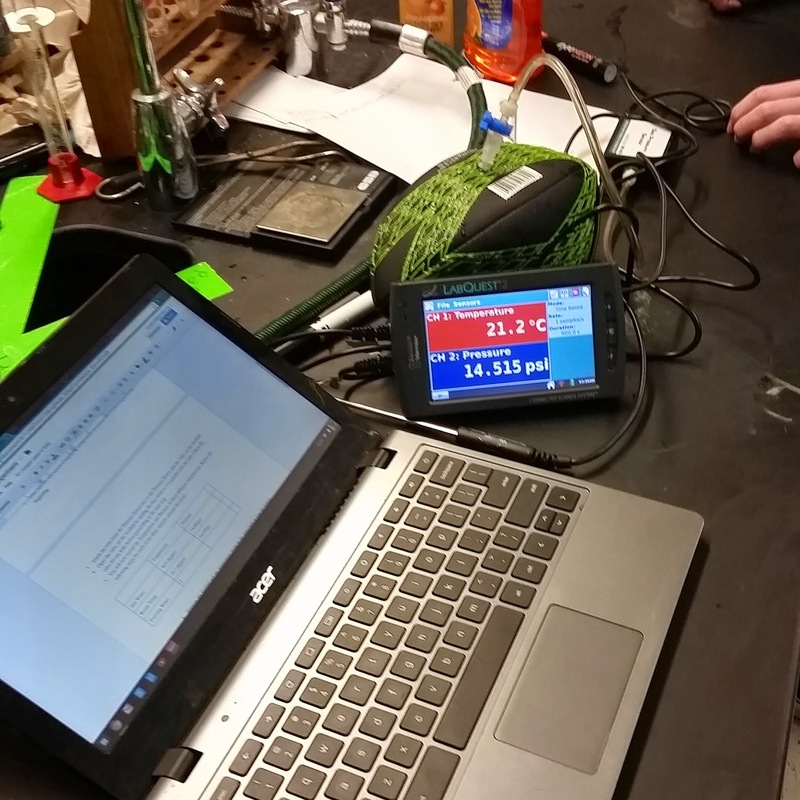 This is the lab setup with the Vernier Pressure Sensor and Temperature sensor all attached to the football. This is how I spent my weekend. Not pictured are the 3 footballs I destroyed trying to figure out how to remove the air valve. FYI, this was a lot harder than it seems. I wrote up a lab experiment for the students to follow just so that we could have consistent results. I had some Gatorade containers like they have on the sidelines of football games for the hot and cold baths, and simply filled sinks for the room temperature baths. You can see the students holding the footballs underwater in each setup so that the air in the balls would actually change. I ran the experiment with 6 groups in each of my 4 classes and NONE of the groups had more than about a 10% change in pressure and that was probably due to the fact that their valve was leaking and letting in water. 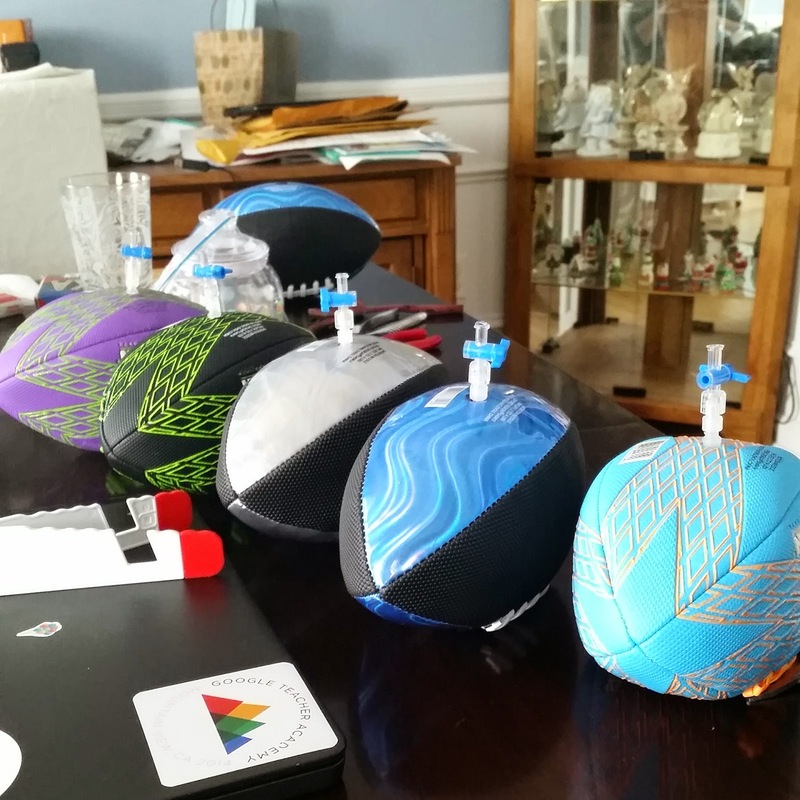 We absolutely confirmed that Pressure and Temperature are directly related, but there was no way that only temperature caused the pressure in the Patriots’ footballs to deflate. Thinking forward to next year, there are a number of changes I need to make to the lab. First, my valves kept popping out which caused massive error. The valves definitely need to be sealed permanently into the footballs so that they can’t leak. Second, I need larger containers for the water baths. Mr. B is going to try this with coolers instead and we think that will solve the problem. Third, since the plug on the football has a valve that will close to seal the air inside, I think I will have the students close the valve and move only the football to each station instead of moving all of the equipment. It became almost like a team-building exercise as they carried wires and probes and data measuring devices around the room. Overall, this lab was a success. I loved that I planned this with a first year teacher. I loved that it had real world application. I loved that it was STEM driven. And I loved how it was real chemistry, but didn’t feel that way to the students. 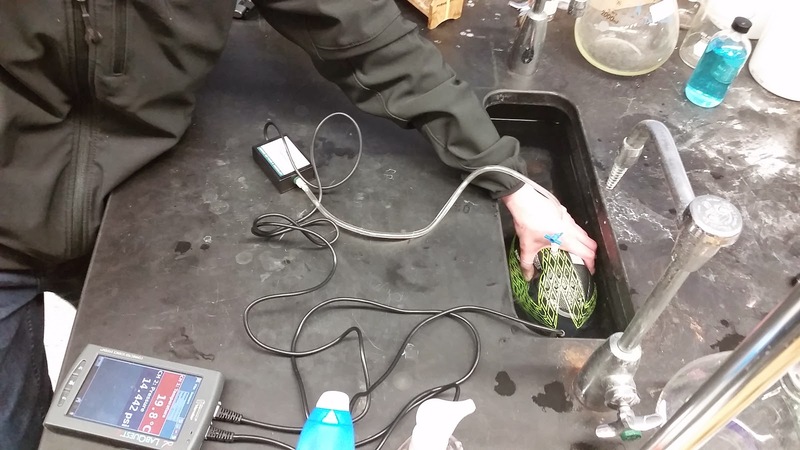 It reaffirms my belief that we need less formal labs and more real-world activities for the students to be doing. I also love that it was messy because that’s what learning truly is. 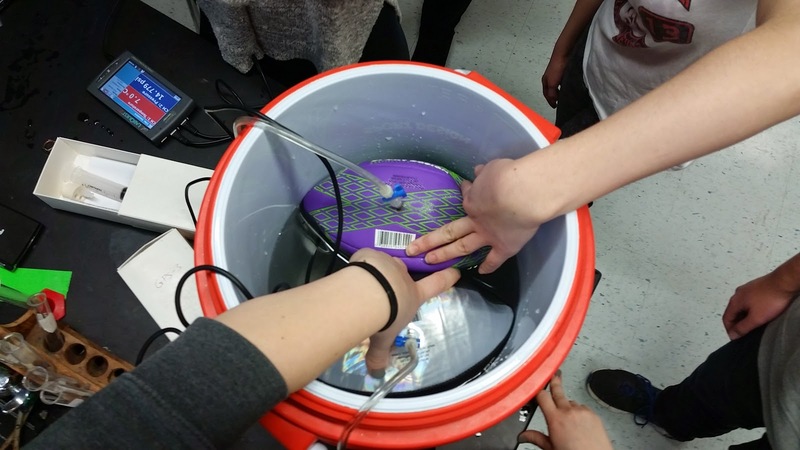 This entry was posted in chemistry, Deflategate, gas laws, STEM, student centered, Vernier on February 4, 2015 by DaretoChem. A group of science educators wanted to see what students’ impressions were of Chemistry class. Immediately before the first day of class, the evaluators asked the students to describe what they thought Chemistry was in three words of less. As they expected, words like fire, explosions, reactions, chemicals, dangerous were among those at the top of the list. At the end of the first quarter, the evaluators returned and asked the same question and were surprised at how the students’ idea of chemistry had changed. Now words like math class, boring, work were at the top and nowhere could be found words about science. One of my biggest complaints about typical Chemistry curricula and textbooks are that they start with significant figures, scientific notation and conversions, very little of which has no impact on Chemical principles or the understanding of Chemistry in general, but rather only how students report their answers. I decided to start with actual Chemistry and teach naming and forming ionic compounds. We then worked backward through the curriculum, through the Periodic Table, basic Atomic Structure, and now we are in the dreaded sig figs and scientific notation. Since I am very activity driven in class I wanted this to be more than notes and worksheets. I trolled Googled looking for “innovative significant figures activity.” It is amazing what some people call innovative. Some things I found were webquests, an “interactive” website that was a just a digital worksheet, and an activity that required students to count popcorn kernels. I decided to just make my own. I went through my sons’ toys and grabbed random objects as seen below. Each student received either a 6 in ruler, 12 in ruler or a meter stick as they walked in the classroom. I then asked them to measure the length of the object in both centimeter and inches and compared the accuracy of both. This part was fun because I made sure the kids with large objects received small rulers and the ones with small objects got the meter stick. We then calculated the volume of their object. This led to a lot of questions because we needed to figure out what was the better measurement to use for the calculation. After this, we answered the Essential Question for the day which was “How many of your object will fit into this room?” My room is an odd shape so the class needed to figure out how to find its volume as well as make the measurements of length, width and height with meter sticks. 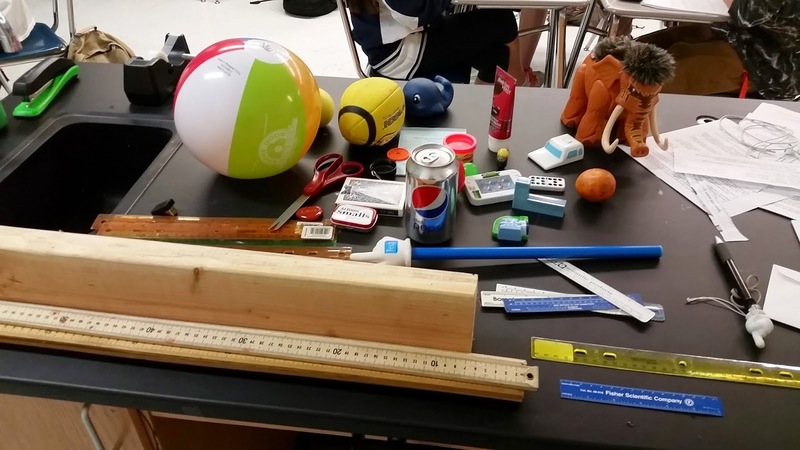 Once each student calculated the number of their objects that fit in the room (the answer really surprised them as many of them had in the millions or even billions) we needed to discuss accuracy of their answers which is where significant figures came in. As we just finished the Quarterly where they needed to use significant figures and scientific notation I saw a definite improvement in the scores involving those questions. There were still students who got those questions wrong, but I noticed during the exam students who were clearly recalling the rules we used and, hopefully, the activity. Was this a fool proof method? Absolutely not. Did we have a lot more fun learning about something so dry as sig figs? Definitely! This entry was posted in #chemisawesome, chemistry, significant figures on November 3, 2014 by DaretoChem. When I first started teaching fifteen years ago, I ran my classroom the way my high school chemistry teacher ran hers. I decided to become a teacher when I was eight years old so I paid close attention in school to what my favorite teachers did with us so I could duplicate it when I finally became a teacher. A typical unit would start with notes. We would cover basic definitions and vocabulary that would be used throughout the unit. I would then move on to example problems and have the students complete questions from the review sheet in class so I could see they knew how to solve the problem correctly. I would assign daily or weekly homework to reinforce what we were doing in class and administer 5 point quizzes every couple of days to check for retention of learning. Somewhere in the middle or latter half of the unit we would perform a lab to give a context to what we had been learning and then close the unit with some sort of major assessment, like a test. This method proved to be effective for a long time. I thought I was a successful teacher because I would see the light bulbs go off for students during the lab. I incorporated more and more lab activities to show students there was a practical reason why they had to balance reactions or memorize Boyle’s law. Lab experiments were the “real-world” uses of the material we were learning because “this is what chemists do.” When I heard students say ‘now I get it’ I felt like a success. Deep down there was something missing for me, though. Science is a ‘Why?” subject; we observe something in the world around us, ask ‘why did that happen?’, design an experiment to test our hypothesis, then go back and revise our original thinking. I wasn’t getting a lot of kids asking why. I got a lot of ‘Oh!’ and ‘Why did you say that in the beginning?’, but not a single ‘why did it do that?’ If lab is my students’ favorite part of class, why do I wait so long to have them perform labs? The labs we use in class are very similar to traditional lab experiments. What has made them more effective is their placement in the learning, how student questions are driving the direction of the lessons, and how students are beginning to see science as exploratory instead of sit-and-get. This entry was posted in #flipclass, Carolina, chemistry on October 6, 2014 by DaretoChem. One of the reasons I like guided inquiry labs is it inspires my students to ask more ‘What if…’ questions. I tried a new lab this year for Stoichiometry in which the students mixed different amounts of baking soda with vinegar. A balloon was placed on the top of each test tube and the students got a great visual for the amount of gas produced. 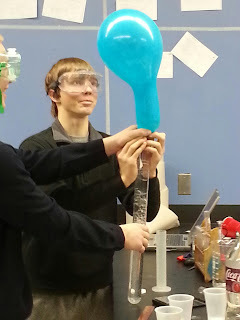 One group finished the lab and I noticed they started to fill another balloon with a very large amount of baking soda. When I inquired about what they were doing, they said they wanted to figure out if they could pop a balloon only using baking soda and vinegar. With wry smile, I told them they could do it, but only if they showed, using Stoichiometry calculations, how much vinegar they would need based on the amount of baking soda they had already weighed out (28g). After some Internet research and a bunch of calculations later, they figured out they needed nearly 400mL (for the non-chemistry folks, that’s A LOT) which is more than would fit inside their 25 mL test tube. I happen to have a giant test tube and the experiment was off. The balloon didn’t pop, but it got really close. When doing these labs, sometimes you just need to let the students’ run with their ideas. It’s amazing what they will come up with and what they will learn (about science and themselves) in the process. 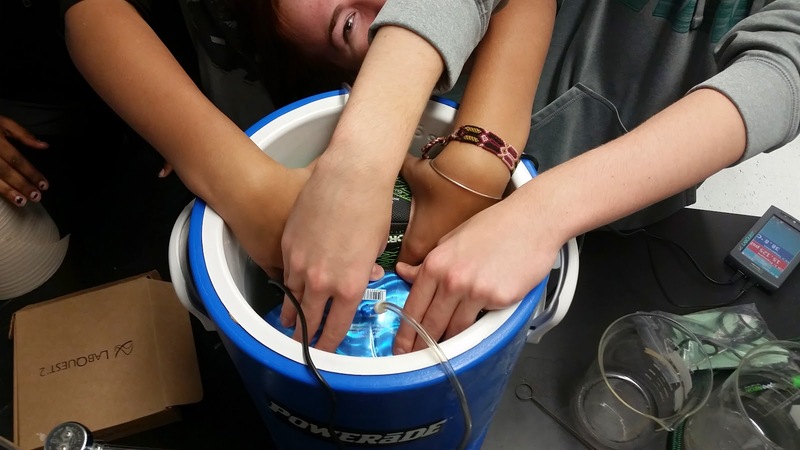 This entry was posted in chemistry, engagement, inquiry, students on April 2, 2013 by DaretoChem.